Home > Catalog > What Is Soil? Young geologists and agriculturalists get an in-depth look at the soil beneath their feet. The book uses photographs to illustrate what soil is, how it’s made, what different types of soil there are, and why it’s valuable to human life. 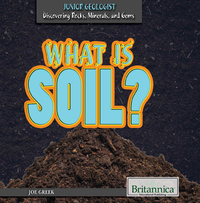 Using age-appropriate language, the book explains how minerals and different creatures make soil healthy. Young conservationists will also appreciate the final chapters on how erosion and pollution affect soil. Vocabulary, Think About It, and Compare and Contrast elements help readers think critically about the text.